A glorious, feel-good romance that will make you want to snuggle up under a warm blanket with a hot chocolate and the one you love. If you enjoy reading Sarah Morgan, Jenny Oliver and Lucy Diamond this book is for you. What I Say....When life is too serious, too busy, too hard, Holly Martin's books are the perfect medicine to help you relax. 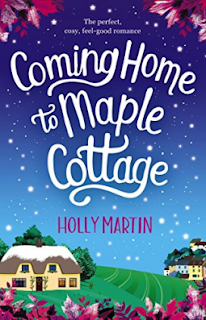 This was the third book in the Sandcastle Bay series and while The Holiday Cottage By the Sea was my favorite in this trilogy, I still enjoyed Coming Home to Maple Cottage. Isla and Leo are meant to be together if only Leo can overcome his low self-esteem and guilt over his best friends death. Isla doesn't want to be the objector Leo's pity, she wants to be the object of his affection. But right now, she has even bigger problems - she hoping to adopt her nephew, and his estranged mother has suddenly shown up. She only wants the money for the house that Luke left, but Isla is terrified that she will want to take Elliott away from her. Leo will do anything to protect Isla and Elliott, even if it means losing everything he loves.